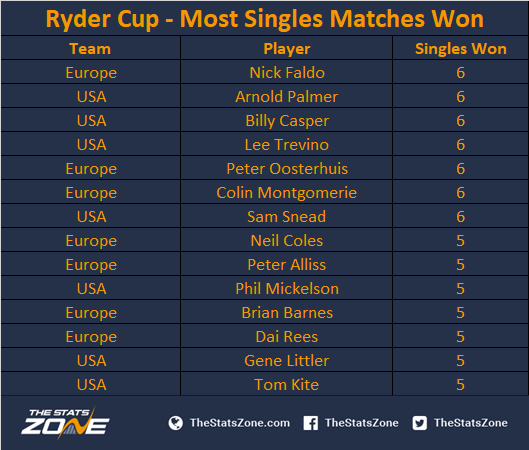 Ryder Cup Stats - Who Are The Most Successful Singles Players In History? In the build-up to the 2018 Ryder Cup in France, TSZ will be publishing a number of articles which examine statistics covering the history of the biennial competition between USA and Europe. Here we look at the players who have claimed the most victories in singles at the Ryder Cup. Seven players - four representing USA and three from Europe - are tied first for singles wins at the Ryder Cup (6). Of those players, Colin Montgomery boasts the best win percentage - 88% - having won six of the eight singles matches he was involved in during his Ryder Cup career. The only player on this list who will be competing at the 2018 Ryder Cup will be Phil Mickelson, who will be given the opportunity to improve on his five wins in the competition.